Beginning a five-day trip to Israel to study advances in spinal treatment, former "Superman" actor Christopher Reeve appealed for urgent research to help victims of injuries and illness. Israel is a major center for stem cell research, reports CBS News Correspondent Robert Berger, and scientists there believe it could offer hope to people with spinal injuries. The 50-year-old actor was paralyzed from the neck down in a riding accident in 1995. "It's about applied research which means helping human beings as quickly and safely as possible," Reeve said at a news conference. "It's important that scientists realize the sense of urgency, that every day counts for patients." He urged scientists not to be deterred by the size of the challenge of rehabilitating badly injured people. "There have been many times when things were thought to be impossible, and now it's routine," he said, noting test-tube babies, heart transplants and walks on the moon. "There are many people who are suffering but there are also many people who are healing," he added. Shalom said that Israeli scientists are working on solutions. "We hope together to bring them new hope and a better future," he said. 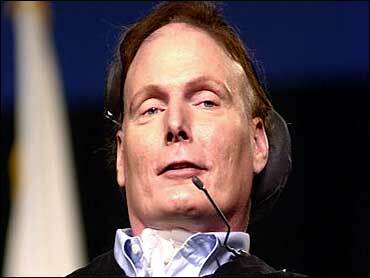 U.S. federal law strictly limits stem cell research and Reeve has criticized the government's stance. In April, he said social and religious conservatives "have had undue influence on the critical debate." During his trip, Reeve will meet injured Israelis, including Elad Wassa, a 25-year-old Ethiopian immigrant paralyzed from the chest down in a Palestinian suicide bombing in May 2002. Reeve has corresponded with Wassa. He will also place a prayer in the Western Wall in Jerusalem.